Calls have been made to better protect seals at a north-east estuary. Fresh calls have been made for environmental chiefs to take a tougher stance on people disturbing seals at a north-east estuary. Forvie National Nature Reserve, at Newburgh, is home to a large colony of the creatures. The spot is popular with the public, with visitors looking to catch a glimpse of the marine mammals. But there have been repeated calls for them to be better protected by local conservationists, after a number of incidents which led to stampedes. Since May last year it has been an offence to harass the seals, after the Scottish Government brought in legal protection and made it an official haul-out. However Ythan Seal Watch, a group that monitors the site, claims the law goes unenforced and has called on the government agency Marine Scotland and Scottish Natural Heritage (SNH) to step up the pressure on people breaking the rules. In the past week there have been three disturbances at the reserve, most recently on Sunday. 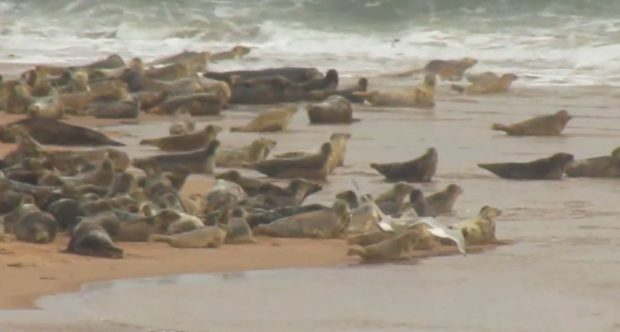 Six visitors managed to scare off more than 1,000 seals in just an hour while they were resting and moulting, with some also heavily pregnant. Lee Watson, from the conservation group said: “What we really need is to be hearing more from SNH and Marine Scotland. “There needs to be a better system for the public to report incidents if they see someone harassing seals. “At present, if someone visits Newburgh and they see someone disturbing the seals they have no way of reporting it except through us. “It’s happening every single week. People are just continuing to ignore the signs. Under the rules, harassment constitutes action that causes a “significant proportion” of seals on a haul-out to leave that site either more than once, repeatedly or abandoned completely. Mr Watson says this makes it difficult for action to be taken against unauthorised visitors because it is often a different group each time. The Scottish Government has urged anyone who witnesses seals being harassed to contact the police. Gavin Clark, SNH operations manager for Tayside and Grampian, said: “We have employed staff over the summer to help tackle this issue and have erected signs on the main routes leading to the haul out – visitors will have passed at least four signs before getting close to the seals. “We have also issued guidance online and in the media on several occasions and are working with the local community to promote facilities for responsible access from Newburgh.